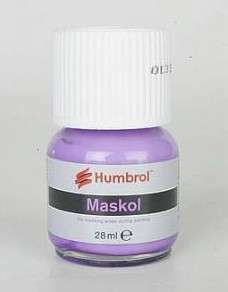 Humbrol Maskol in a 28ml bottle with brush applicator. Maskol is a masking fluid which dries to a rubbery consistency and is used for masking prior to the application of paint. It is ideally suited to masking items where masking tape cannot be easily used.